Otitis means inflammation of the ear and causes ear problems in puppies. Otitis refers to a condition which may develop suddenly (acute), or be ongoing (chronic). Puppies with drop ears (floppy ears like Cocker Spaniels) are more prone to developing otitis than breeds with naturally erect ears like German Shepherds or the breeds that have their ears cropped. 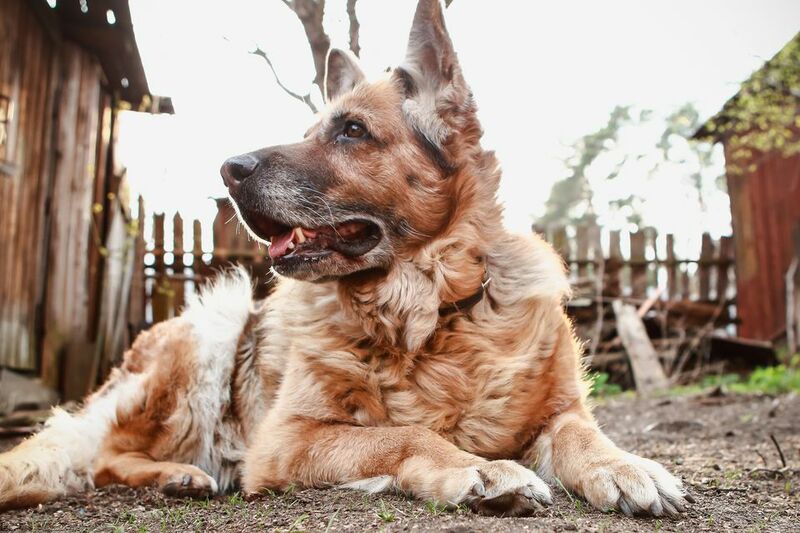 In fact, up to 80 percent of canine ear problems treated by veterinarians occur in drop-eared dogs. The infection is typically brought on by poor air circulation that promotes moisture in the ear canal conducive to the growth of bacteria, yeast or fungus. Anything that throws off the normal balance of the ear secretions can result in otitis. This can be caused by something as simple as getting water or soap in the ears during a romp in the lake or during a bath. Other common causes include a foreign body (like a grass seed), parasites like ear mites or ticks, excess hair or mats in or around the ears, allergies, or excess wax production. Most cases are confined to the external portion of the ear canal and/or the ear flap (pinna) and are termed otitis externa. Otitis externa occasionally advances into the middle ear (otitis media), and even more rarely into the inner ear (otitis interna). Signs of otitis include painful and sometimes itchy ears that may be red, raw, or even bloody if the dog has scratched them. Dogs typically hold the painful ear down, tipping their head. Excessive shaking or scratching may result in a hematoma. A bad odor from the ear indicates infection, as does any sort of discharge. Normal wax is light amber; an abnormal discharge is anything different. Red, itchy ears without discharge are probably due to allergy but may progress to infection due to scratching trauma. Otitis media usually results from an ascending infection from the external ear canal or penetration of the eardrum by a foreign object. From there, the problem can progress into otitis interna, which can cause severe signs and permanent damage. Signs of nerve involvement, such as head tilt, droopy eyelids or a facial palsy on the affected side, indicate middle to inner ear involvement. Inner ear infections can interfere with balance, and dogs will walk in circles and/or fall toward the affected side. Severe damage from otitis may result in deafness. Treatment depends on identifying and addressing the cause of the inflammation. Sedation is often required because the ears are typically very sore. An instrument called an otoscope that has a magnifying lens and light allows the veterinarian to examine the horizontal and vertical ear canal to see if the eardrum is intact. The status of swelling or scarring of the ear canal is evaluated during the exam, and it's determined if a foreign body is involved. The veterinarian also collects a sample of the discharge when present, and examines it under the microscope to identify the type of bacteria, yeast, fungus or parasite that is involved. Treatment begins with a thorough cleaning and drying of the ears; general anesthesia may be required. Your veterinarian will know which cleaning solutions are most appropriate. If the eardrum is ruptured, some solutions or medications can actually damage the middle ear, and make a bad situation even worse. Wax-dissolving solutions are particularly helpful with pups suffering from seborrhea. After the initial cleaning and flushing of the affected ears, most cases can be treated by owners at home once shown how to medicate the ears by the veterinarian. Topical antibiotic ointments and drops, sometimes with steroids to reduce itchiness and inflammation, are generally prescribed for bacterial infections. Medicine is usually administered twice a day for two weeks. Fungus and yeast infections require antifungal medications and typically take longer to resolve and often recur. If the infection is caused by more than one thing, an antifungal/antibacterial cream may be prescribed to address all issues. Treatment usually resolves acute otitis within two or three days, but chronic problems take much longer to cure and often recur. If the eardrum is punctured, six weeks or more of treatment may be required to prevent permanent damage to hearing or balance. Sometimes the veterinarian must lance the eardrum to relieve the pressure of infection that has built up; usually, the eardrum heals quickly. Chronic problems tend to leave the ear canal swollen. When this is the case, or when infections are deep inside the ear, drops and ointments may not reach the source and surgery may be necessary to clean out these pockets of infection. Long-term oral antibiotics are given to fight the infection, along with steroids to address inflammation and protect nerve involvement. Surgical restructuring of the ear canal may be required in cases of severe chronic infection. The vertical portion of the canal is removed, and a new opening created to allow better aeration and drainage. When there is severe damage to the middle or inner ear, neurologic signs may continue for the rest of the dog's life even after the infection is cured. The best way to prevent otitis is to keep your pup's ears clean and dry. Avoid getting water into the ears during baths, and inspect the dog's ears for grass awns or other debris particularly after rambles through the brush. Your veterinarian may dispense a drying agent or acidifying solution for use in your dog's ears, particular water-loving dogs that are hard to keep out of the water.